18x13}4' inches. Complete with wood pencil. Shipping weight, 1 pound 4 ounces. plays alphabet, numbers and pictures to copy. inches wide. Shipping weight, 4 pounds. Wall Blackboards for home, office. presswood coated with smooth composition. 36x24 in., 7 lbs. ; 24x18 in., 4 lbs. 79 N 03822-36x24 inches• . ...... .
wood parts. Chalk and eraser included. specially designed to include extra educational features. all, 45Y, in. high, 22Y, in. wide. Chalk and eraser. 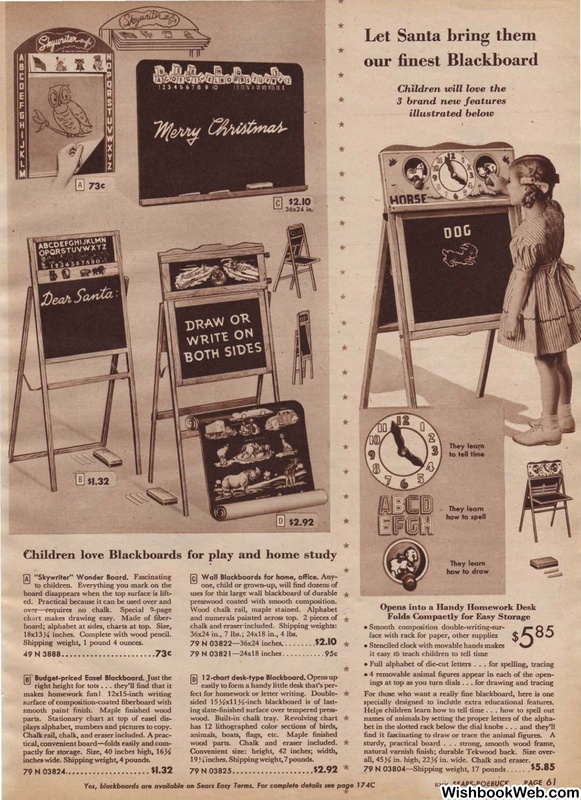 Yes, blackboards are available on Sears Easy Terms.